Here we are, half way through 2007 (can you believe that?! ), and six long months to go before Christmas. Telerik has decided to help you make it through the rest of 2007 by bringing you Christmas in June. 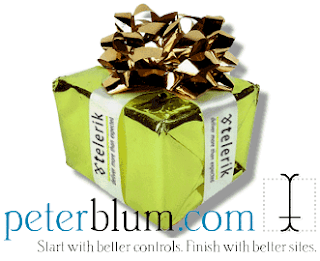 We have partnered with Peter Blum to extend an incredible offer to Telerik customers. If you have a Telerik RadControls subscription, you will be able to get a free site license for Peter's VAM: Essential Validators (a $250 value). You will also be able to upgrade to the Pro VAM suite with an exclusive 20% discount (up to $200 value). If you've never used Peter Blum's controls in the past, then you may not know that his controls are consistently the top rated data input and validation controls by ASP.NET developers. The Essential Validators being offered here have 14 different validators, but Peter offers more than 40 in the full Pro suite. Obviously, these controls are a great compliment to the RadControls for handling all of your advanced validation needs. This offer will run through July 31st and is available to all RadControls subscription holders. If you've been waiting for a good great reason to upgrade your RadControls trial to a subscription, this is definitely it. Watch for a link to the free license sign-up page in the June issue of Telerik's Newsletter (which should be arriving in your Inbox this week).